Stardust is unique - a new white-fleshed cherry which is also self-fertile! White-fleshed or "blush" cherries are rarely available in the shops because they bruise more easily than the dark-fleshed varieties. Cherry enthusiasts often prefer white-fleshed cherries for their rich flavour, but almost all cherries released in the last century have been dark-fleshed varieties. The traditional white-fleshed cherry varieties are not self-fertile, and often have complicated pollination requirements, making them unsuitable for gardens and small orchards where space is limited. Stardust is however a fully self-fertile white cherry, that can be planted without the need for another pollenizer tree. 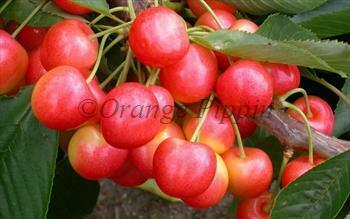 Stardust cherries are a medium size, orange-flushed, with a distinctive firm creamy-white flesh. They are fairly easy to grow, have an excellent flavour, and make an interesting addition to the home orchard. StardustTM is a trademarked variety. Please fill in the details below and we will let you know when Stardust cherry trees are back in stock. Stardust is in flowering group 4. Stardust is self-fertile and does not need a pollination partner, although fruiting may be improved if there is a compatible tree of a different variety nearby. Stardust flowers a bit later that most cherries, and is a good pollinator of other late-flowering cherries. It has some resistance to fruit-cracking, although as with all dessert cherries, heavy rainfall at harvest time can induce splitting. Stardust cherries tend to ripen over the course of several days, rather than all at once. This is an ideal quality for the gardener, because it means ripe cherries are available to be eaten fresh from the tree over an extended period. Stardust was developed at the famous Summerland research station in British Columbia, and released in 2002. It is distantly related to Stella, which was the first self-fertile cherry.